Our National Day is our pride. This is the day where we celebrate the historic achievement in the life of the Arabian Peninsula; the cradle of the Arabs' civilization and the revelation of the final divinely message. It is in this land where everything has started since days immemorial. It is from here were the first steps began towards a new dawn of humanity, peace and love. Here is the house of God. Here is Mecca and here is Medina the beloved city of Prophet Muhammad (PBUH). This is not just an ordinary place. It is different from any other place since the written human history. Here is the Ka'aba which is protected by our Lord who chooses for it those who can take care of it and serve pilgrims from all over the world. Here all deeds are done to appease God alone and not mundane purposes. It is here that Prophet Muhammad and his companions cleansed this holy land from idolatry and raised the banner of monotheism. Here is Saudi Arabia where the glorious past with all its elegance meets the robust present and a promising future. We have always celebrated the National Day in the Kingdom, but the fact is that this day has long been absent from the Saudi patriotic thinking. It is true that this day usually witnesses variety of events, but the Saudis rarely attend them because they see this day to be simply an off day and an opportunity to rest. 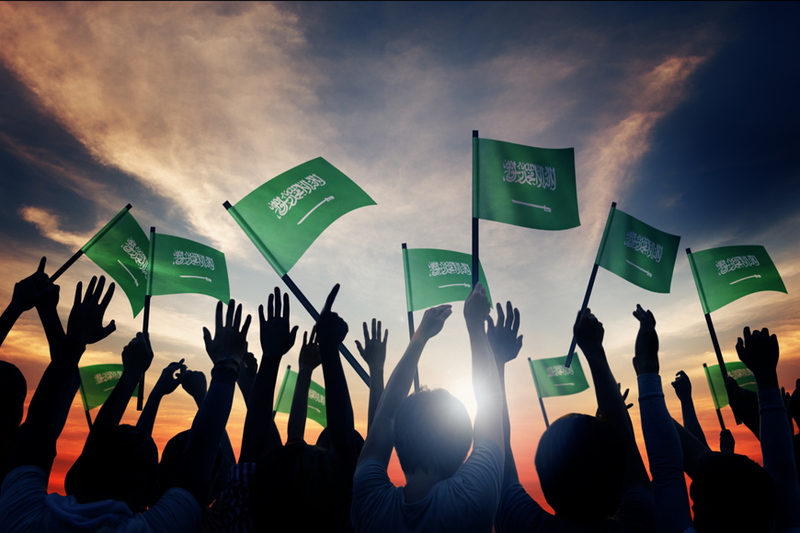 The reasons for what may look like absence of enthusiasm is not lack of organization, empowerment or governmental role, rather it is attributed to those who form the mindset of the Saudi citizen about his country's national day. I will not indulge in comparing our country with any other country in the world; rather I will try to discuss the methodology of our national thought as Saudis. Supposedly, all of us love our country and are ready to defend it, but it is noticeable that we didn't interpret this attitude on the ground by attending celebrations of our National Day. On the contrary there are some people who believe that these events are unwanted. However, in view of the current turbulences in the region and huge fluctuations in all aspects of human life either in politics and economy, in addition to schemes, wars and conflicts, we must pay attention to the overall manifestation of the patriotic thinking and the national spirit, because such manifestation sends more than a message, both to the world around us as how much our internal conditions and home front are strong and also to our youth and our children as how much our homeland is dear, precious and beautiful, and that it is worthy of our love and sacrificing our souls and blood to defend it. Despite some of my reservations on some events related to the National Day, I believe that simplicity of expression is the strongest language of expressing love to our country. So in addition to attending the next national day celebrations I suggest that every Saudi citizen and everyone else living on this soil should hoist the Saudi flag on the door of his home, along with pictures of our leaders. By doing so we can convey to the world the true image of the Saudi citizen and eventually the real meaning of moderate Islam; the religion of love and peace, and that Saudi Arabia represents the spirit of harmony, and that its land is inviolable against every oppressor.